When Mike Ensminger is building a piece, there's no telling what might be inside, but once you see the final product you don't question his creative genius. "That's what I like about this stuff, is all the blood sweat and tears that goes into this work, its permanent its going to be here long after I'm gone," said Ensminger. He made everything from a 12-foot transformer looking statue that now sits on the I-X Center floor, to countless smaller pieces right from his Elyria garage. "I never really envisioned the art picking up the way that it did and getting as much attention as it has, so I'm very encouraged by that and I'm excited to see what's around the corner," he said. But Ensminger, who owns Iron Image Design , wasn't always this optimistic. "I remember, being locked up and totally hopeless, sometimes we have to go through rough things in life to put things into perspective," said Ensminger. Once he got out of prison, he vowed to turn his life around, so he went back to school. "I was doing a small art class for one credit," he said. "That's when I learned that I had a skill in the 3-dimensional art." Now he shares his gift with local businesses in Elyria. He- helped design 'The Foundry' downtown. "I got with the owners and we worked to make some specific pieces for the restaurant that kind of speak to the customers," he said. 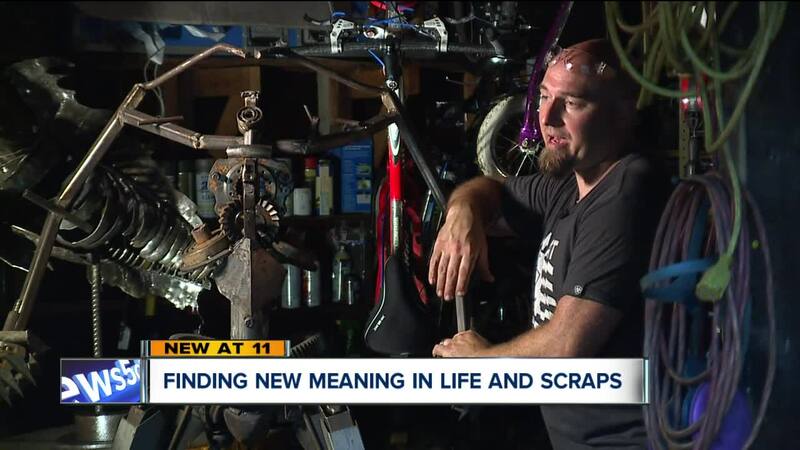 And he hopes his love for welding pieces that others simply throw away will be an inspiration for those still looking to find their way. "Look into where your heart leads you," said Ensminger. "Because that's when you can meet your full potential that's when you're going to be able to challenge yourself and enjoy what you do."